The photographers’ excitement to be involved led to a number of photo sessions for “fighter families” as Dawson calls them. After just a few sessions, it was apparent the Gold Hope Project was a hit. Four-year-old Ava loved to smile. But one day, she began to lose her balance and had trouble swallowing. After a visit to the doctor for what her parents thought was an ear infection, Ava was diagnosed with a rare and terminal type of brain tumor called diffused intrinsic pontine glioma (DIPG). “To say we were devastated is an understatement,” Ava’s mother, Cynthia Dawson, co-founder and President of the Gold Hope Project, said in an interview with CURE. After discussing the treatment options available to them, Dawson and her husband packed everything up and moved from their home in Texas to Arizona, where they enrolled Ava in a clinical trial. Once they settled in to their new home, Dawson searched for a family photographer in Phoenix to help capture Ava’s smile forever, but unfortunately, the costs of the move and extra medical bills made it difficult to afford a high-quality photographer. 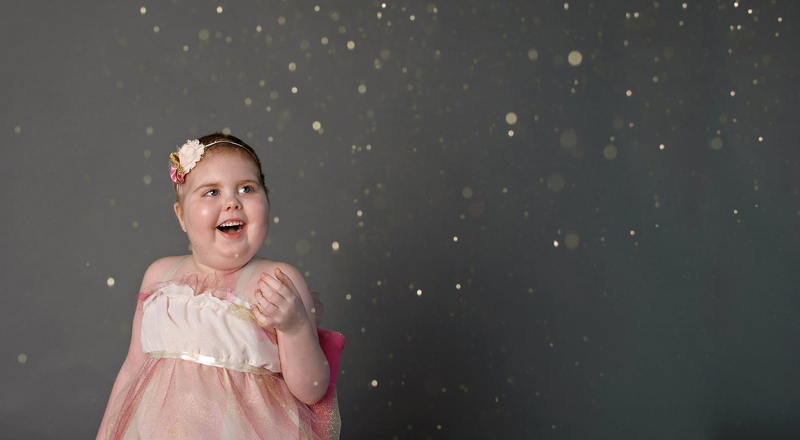 Luckily, a photographer and friend named Morgan gifted a portrait sitting to Ava and her family, where Ava got to wear a pretty pink dress (her favorite kind) and play with glitter to her heart’s content. Sadly, Ava passed away in November 2012 at just 5 years old. But with her photo session, the seed of the Gold Hope Project had been planted. Once she started the Gold Hope Project, Dawson found an enthusiastic audience. The photographers’ excitement to be involved led to a number of photo sessions for “fighter families” as Dawson calls them. After just a few sessions, it was apparent the Gold Hope Project was a hit. Thanks to the power of social media and word of mouth – and the talents of the photographers involved with the project – the project spread and the Gold Hope Project took off around the country. “Social media has been a huge reason for the growth we have seen in our organization,” Dawson said. Then the family and photographer work together to plan the session date and location. After their session, the family receives their photos and the Gold Hope Project shares the fighter’s story and images on their social media channels. As for what’s next for the Gold Hope Project, Dawson has set her sights high. In addition to continuing to help families by providing them with lasting memories of their children, fundraising for research is on the horizon. For more on the Gold Hope Project, including information on how to volunteer or donate, visit The Gold Hope Project.